NAFLDsym v2A includes mechanistic representation of fibrosis, steatosis, lipotoxicity, and inflammation. Over 1000 simulated patients with variability in their underlying pathophysiology, represent a spectrum of fibrotic disease (F0-F4 stages). Multiple biomarkers (e.g., MRE, MRI, ALT, NAS, Pro-C3) for patient stratification and evaluation of efficacy are included. Significant enhancements have been made throughout both ADMET Predictor and MedChem Designer™. DILIsym is a mechanistic, predictive software tool focused on predicting and understand drug-induced liver injury across species. DILIsym version 8A is packed with exciting new features. Molecules that violate conventional guidelines for druglikeness—such as the Rule-of-5—are of increasing interest as chemical probes and drugs for intractable pharmacological targets. In vitro-in vivo extrapolation (IVIVE) has been a major focus of biopharmaceutics research over the last 20 years, and integration of in silico models built in GastroPlus™ help researchers identify in vitro methods for dissolution and precipitation that are more predictive. DDDPlus™ 6.0 is our updated in vitro platform that provides new functionality and models to evaluate precipitation kinetics of formulations. Bioavailability/bioequivalence (BA/BE) evaluation by employing in vitro dissolution/release data and clinically relevant specification is required by the regulators. For BCS 1/BCS 3 drugs formulated as immediate release (IR) oral dosage forms, a BCS-based biowaiver may be granted based on the in vitro dissolution profiles generated across the physiologically relevant pH range. For drugs/formulations with dissolution/release limited/controlled absorption, establishing Level A in vitro – in vivo correlations (IVIVCs) can be applied and further utilized to assess whether BA/BE is recommended. It is widely recognized that food can affect the absorption of orally administered drugs. In the course of pharmaceutical development, food is evaluated clinically as part of the early single or multiple ascending dose studies; additional evaluations often take place when there are formulation changes. The outcome of these studies informs dosing instructions both during the conduct of clinical trials as well as on the product label. Significant enhancements have been made to the HTPK Simulation, MedChem Studio™, and ADMET Modeler™ modules in ADMET Predictor 9. ADMET Predictor 9™ Release Webinar: Streamline Your Drug Design with ADMET Predictor 9! We are pleased to announce the release of ADMET Predictor™ 9! 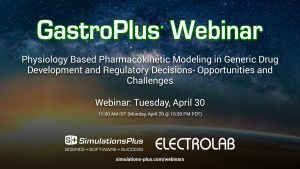 Significant enhancements have been made to the HTPK Simulation, MedChem Studio™, and ADMET Modeler™ modules. 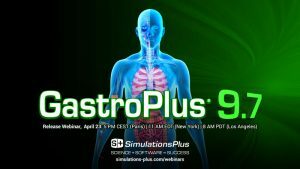 We are pleased to announce the release of GastroPlus™ 9.6! 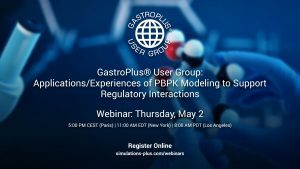 These improvements in our top-ranked PBPK modeling platform support discovery/preclinical/clinical R&D work through regulatory interactions.